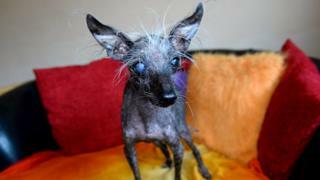 Britain's "ugliest" dog, who had a cataract and no teeth, has died aged 16, his owner has announced. Chase, a Chinese-crested hairless, came third in California's World's Ugliest Dog contest in 2017. His owner Storm Shayler, from Neath, south Wales, said he died of pancreatitis. "Even at the end he didn't lose his sparkle," she said. "He was a small dog with the biggest personality and really was one of a kind." Who are the world's ugliest dogs? Miss Shayler said she "never imagined" Chase, whom she bought from a puppy farm, would win a prize in the competition. Chase won a trophy in the contest for his cataract in one eye and his "crab-like" walk. Miss Shayler said: "He lapped up all the attention on the day like a little star and loved showing himself off. "He loved to boss me around and he'd bark or whinge when he wanted his dinner. But he loved cuddles, too. No one will every replace Chase; he really was one of a kind." The winner of the ugly dog contest was a three-year-old Neapolitan Mastiff, Martha; while second place went to Moe, a 16-year-old Brussels Griffon-pug mix - the oldest dog in the competition.